I am completely smitten with the Tarot of the Magical Forest. I don’t often go looking for new tarot decks. I have about, um, twenty or so. I think. I haven’t counted them in awhile. Most of them are in a hatbox but there are others tucked on bookshelves here and there. I am extremely picky about my tarot decks. I gravitate toward interesting yet consistent art and I like decks that have their own personality but still have recognizable traditional imagery. And I’m a sucker for something whimsical. So I don’t know how the Tarot of the Magical Forest stayed under my radar for so long, because I instantly adored it. The Hanged Man batty is particularly fabulous, mostly because it’s so appropriate. 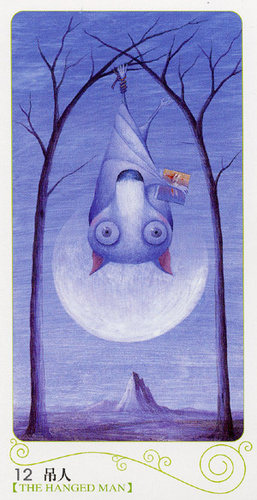 The Hanged Man is one of my favorite cards in any deck, it’s odd and perplexing and so much of it is about perspective. It always reminds me of Odin on Yggdrasil. Sacrifice for insight. I’ve been thinking a lot lately about perspectives and changing as I’m doing massive amounts of editing and rewriting. I am being extremely productive but also extremely thoughtful and reflective about everything as I go over it. It’s really all about perspective: each character sees the same things colored by experience and role and knowledge. And I get to choose which perspectives are shown when, and in which combinations and how to have them all unfold to tell the story. It’s rather daunting, really. But I’m finding in editing I can turn things every which way to approach it from any angle. I already have the bulk of the work there, now it’s about filling holes and expanding sections and making it into a cohesive whole. I can work from one character’s angle and then another’s, and I find unexpected things along the way. And when I get stuck I can turn it another way, work on it from another viewpoint. Maybe that’s the benefit of working non-linearly. Though I suppose it might work with anything. I sound particularly optimistic today. I blame the adorable batty, though I hope it continues. Staying up until 3am again, under half an hour to go. I rather like this. One of my writing books suggests writing at different times of day to figure out when you write best. I seem to be a late night writer. Or a two glasses of wine writer, since the combination seems to work well. I wrote about 2,000 words today, some in the afternoon but most over the last couple hours. I am very pleased with the result, as it was a tricky bit of a scene that hadn’t been cooperating earlier and now I like it quite a bit. It’s interesting how all these bits and pieces are slowly but surely forming a whole, almost of their own volition. I’m feeling like things are starting to align properly, which is a much better feeling than the frustation and doubt that I’d been feeling previously. Kittens are, as ever, confused with the late night write-a-thon. They have spent most of the last hour chasing a bug around the studio and now Tessa is sitting on the table behind me and squinting at me tiredly, as though I am keeping her up with this disruption in routine. Poor thing. I really don’t think my novel would be anywhere near as almost-done as it (sort of) is if it were not for the wonderment that is Scrivener. I downloaded it earlier this year, faced with the prospect of editing 100,000 words worth of very roughly drafted short vignettes and desperate for better organization than I could get with Pages or Word. It is the bestest thing ever. I have a master document for the novel draft. Each vignette has its own document within that. I have a column down the left side to organize them all and I can shuffle their order by just clicking and dragging. On the right side I can jot down random notes, which I do. Often. I can label things by timeline! I can make little magic notecards with color-coded pushpins! It is the Bestest. Thing. Ever. Seriously, I wouldn’t be halfway as far as I am with revising and editing were it not for Scrivener. I have another project document for short pieces (each in their own section), and another for notes & works in progress. I’ll probably do NaNoWriMo in Scrivener this year, too. I am not a terribly organized person, and I tend to write in fits and starts and non-linear bits and pieces. Scrivener makes it really easy for me to take all that literary flotsam and tie it together into something resembling a novel. I went blueberry picking with Kyth & Amy in New Hampshire this weekend. We managed to have lovely weather despite the ever-present summer storms, and we had a marvelous time. I’ve never been blueberry picking before. 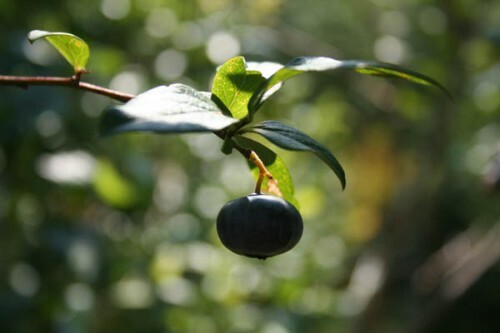 Apple picking many many times but never blueberries. 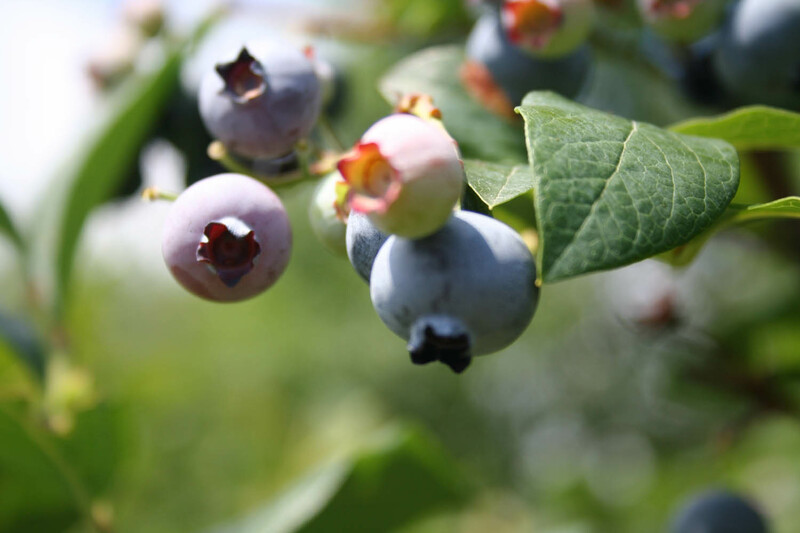 It takes a lot longer to fill a bucket with blueberries than it does with apples. I was glad that I’d brought my camera. Berries are fun to capture in their natural habitat. I was struck by how much blueberries look like itty bitty pomegranates in shape, and surprised that I’d never really noticed it before. I have always loved frozen blueberries. I would eat them by the handful when I was little and my mom would freeze them, sneaking them out of the freezer and not always leaving a reasonable amount left for whatever baking purposes they had been intended for. I will endeavor to be better with these. I am probably going to make blueberry cookies tomorrow, and possibly some sort of blueberry cake type something later in the week. Or scones, perhaps. I like having the ability to take a day trip to pick berries on a farm as easily as we can take a day trip into Boston. And I like that we live in a sort of in-between place that’s not too urban and not too rural. I used to think I was a city girl but I never really was, though I am not much of a country girl either. I am something in between. Or maybe I am all kinds of girls, and I fit better in the places that leave me free to be all of them. Yesterday while I was making my tea I happened to open the freezer (I don’t even remember what I was looking for, there wasn’t much in there other than frozen fruit and vanilla vodka) and discovered that my ice cube trays were full of water rather than ice. And the water wasn’t even particularly cold or frosty or in any manner on its way to becoming ice. Then I checked the fridge and noticed it was remarkably close to room temperature. The night before we’d had a bunch of little power outages, the power would go off for 30 seconds or so and then switch back on and the tv would come back with much higher volume on the Olympics coverage. (We’ve become addicted to the Olympics, completely unintentionally. The opening ceremonies were gorgeous.) This happened about half a dozen times, so I’m guessing something burnt out some magic cooling something or other. We tried a few easy things to see if we could fix it but alas, it appears to be unfixable. Our very nice landlord is buying us a new one. I plan on getting ice cream once I have the ability to freeze again. Oddly, though this is really inconvenient and has me drinking lots of tea and eating lots of Nutella on various bread products, it really couldn’t have happened at a better time. The weather is cool. We didn’t have all that much perishable stuff in there at the moment. We’re going to be gone most of the day tomorrow (going to see Radiohead tomorrow night, yay!) and the new refrigerator should be delivered on Thursday, which the boy had already taken off from work so I don’t have to wrangle kittens and handle delivery guys all by myself. I’m wondering if this is some sort of cosmic lesson in problem management, that things like this that are unexpected and annoying are still manageable and not necessarily stressful unless you make them stressful. Or it could just be a case of a bad thing having remarkably good timing. It’s raining again, thundering and dark. I have lived in Massachusetts all my life and I don’t remember ever having a summer this stormy. I do love a summer storm, but this is kind of insane. It is nicely moody, though, even when the thunder frightens the kittens. I made a chart for the novel. I mentioned this already, but I like it so I’m going to babble about it more. It’s not a chart, exactly. More like a big page of color-coded lists of vignettes with a timeline below it to keep everything in order. No lightning, though, at least as far as I can tell. I like my chart. I’m not usually a chart/notecard/etc kind of girl but this is kind of helpful and makes finishing seem a lot less daunting. Only 12 vignettes are really unfinished, and only maybe 10 more need heavy rewrites. Out of 42 or so. That’s no so bad. I keep saying this, so it must be true. That one was loud, the kind of thunder that actually sounds like cymbols crashing. I think the kittens are getting used to it, this one didn’t even make Tessa blink. The rain outside actually sounds like one of those rain sticks that are supposed to sound like rain as it’s bouncing off the pavement. I didn’t think those sticks were supposed to sound like rain on pavement, really, but that is what it sounds like. I hung my chart up over the iMac, so I can just look up and refer to it while sitting at the desk. This seems easier than going through notecards or whatnot. I already have a file open for the 12 vignettes that need writing. I have at least a few hundred words and notes for each of them, which will help. I am hoping to have drafts of all of those by the end of the month, which should be doable. It’s really pouring now, past the rain stick sound because the noise is just continuous. I am resisting the urge to go stand out in the rain, it’s a bit too cold for that anyway. This blog is one month old today. 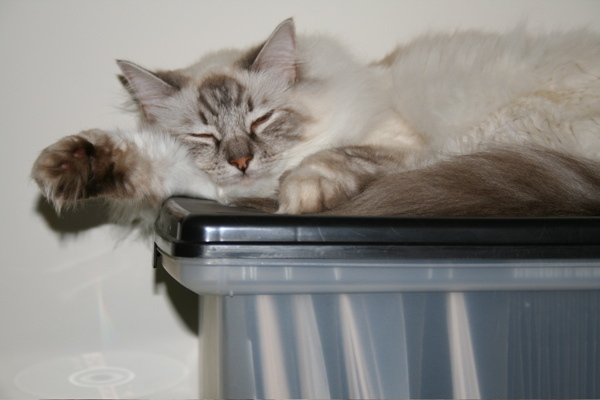 This is Tessa, sleeping on the file box I keep art prints in. It has been her napping spot of choice when I’m in the studio for awhile now. She gets very irate when I have to move her. And this is Bucket, sitting on the floor behind me. 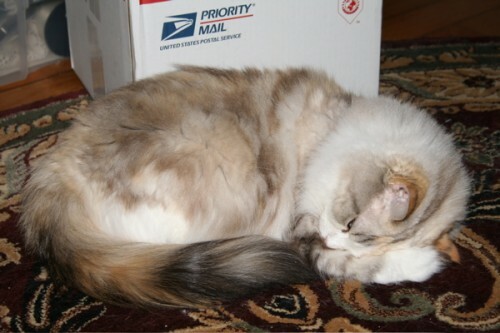 Though she is not hiding in difficult-to-photograph places today, she is still a bit camera shy. Or possibly just doesn’t like Radiohead. They are lovely, fluffy things even though they are not terribly helpful. I was going to post pictures of kittens but they are being uncooperative. Likely because it is absurdly humid and they are absurdly fluffy and like to flop in difficult to photograph places. I have been on internet hiatus this week, which usually involves me avoiding the internet save for important things like e-mail and whatnot. It is remarkably beneficial to my productivity level. During this particular hiatus I finished the sixes for the Phantomwise Tarot and drank a lot of wine and thought about the novel a lot. I have something of a timeline for getting things done and I’m going to make charts and maps and helpful tools that will be, well, helpful. I hope. Tonight the Phantomwise Tarot Shinies go on sale at Wyrding Studios. I have spent a fair amount of the day promoting them in various places and playing e-mail tag with Kythryne. I’m excited about it, I haven’t even seen the finished product in person but I’m sure they’re even lovelier than the photos, since Kyth’s stuff usually is. I am very much ready for it to cool down and be nicely autumnal already. I always feel out of my element in the summer, despite being a July baby. I want sweaters and pumpkin spice lattes and crispy air and kittens that are more easily photographable.